These are the words of Jesus in his final teaching session with his disciples before heading to the garden to talk with his Father on the night he was betrayed. This is the life-long journey we are on – towards the truth. God sent the Holy Spirit because he knew we would need a Guide for this journey. We don’t know the way. When we go to God, he sends our Guide who will show us the next step. As we read God’s word to us, the Holy Spirit has a free rein in our minds. He points out truths and helps us understand. Whenever we are lost or confused, seeking God is the right thing to do. Our Guide is always with us but his ability to help is limited when we’re not paying attention. Reading the Bible helps us focus on God and then our Guide can accomplish his work of transformation in our lives. We won’t know ‘all truth’ this side of heaven. 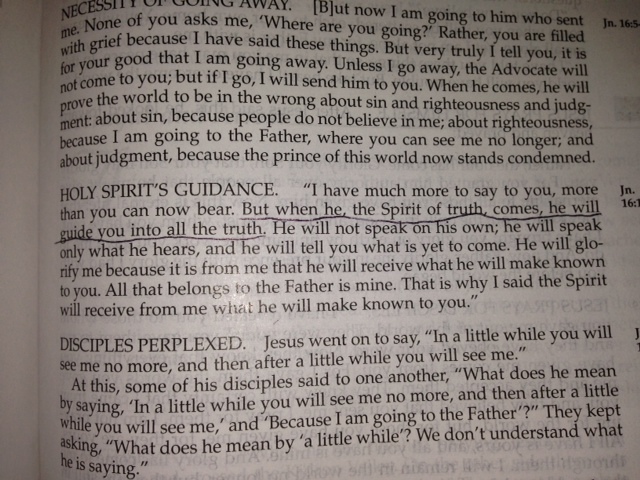 But our Guide is here to help us understand what we need to know to keep our lives in the center of God’s will for us. Thank you, dear Holy Spirit.